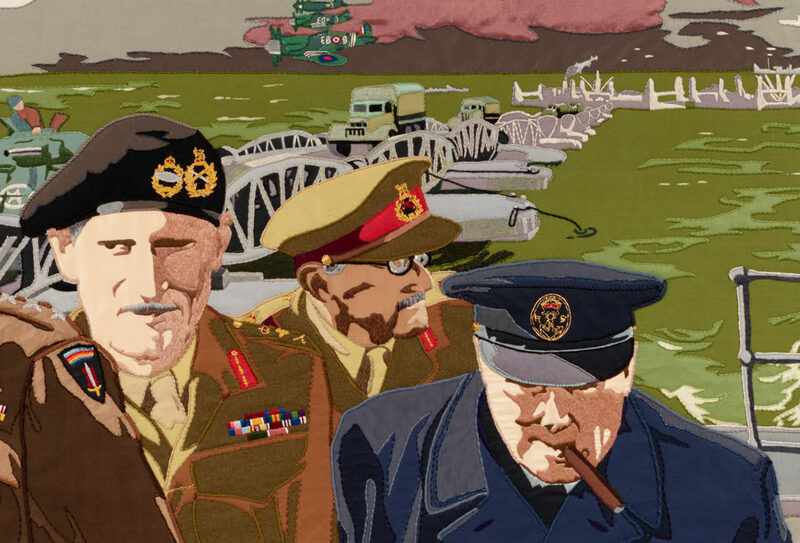 The Overlord Embroidery tells the story of D-Day and the Battle of Normandy in 34 extraordinary hand-stitched panels with a total length of 83 metres. Lord Dulverton commissioned the embroidery in 1968. He set up an advisory committee including retired senior officers from the army, navy and air force to help him with the project. Together they decided what events the embroidery would represent. Sandra Lawrence, a young British artist, designed the embroidery. She looked at hundreds of wartime photographs as she researched the subjects she had to portray. Sandra drew small pencil sketches of her initial designs and presented them to the committee. When a sketch was approved she painted a colour version measuring 2.4 x 0.9 metres, the same size as the embroidered panels. Finally she placed a sheet of tracing paper on top of each colour painting and drew the outline of every shape on it. The 34 colour design paintings by Sandra Lawrence now hang in the Pentagon, Washington DC, USA. The Overlord Embroidery was stitched by a team of highly skilled women at the Royal School of Needlework in London. They used a technique called appliqué, stitching smaller pieces of fabric onto a larger background piece to recreate the pictures in Sandra’s designs. The embroiderers transferred the designs onto linen using an ancient method called ‘pricking and pouncing’. They pricked thousands of tiny holes through the lines on a tracing, pinned it on top of a panel and rubbed a fine powder called ‘pounce’ through the holes to make a trail of dots. They joined the dots together with a pencil line to reveal the design. The embroiderers chose fabrics carefully, matching the colours in the designs as closely as possible. They cut out the shapes they needed and stitched them onto the panels. Sometimes they stitched several layers of fabric on top of each other. Sometimes they added stitches on top of the fabric to show extra detail. More than 50 different materials were used in the Overlord Embroidery, including actual uniforms. Everything was stitched by hand. It took five years to stitch the Overlord Embroidery. The final panel was finished in January 1974. 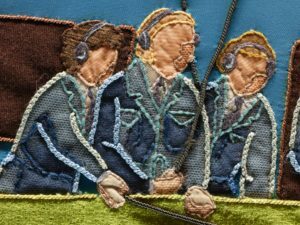 We are investigating options to fully digitise the Overlord Embroidery to make it available as an interactive exhibit on this website. Meanwhile we hope that you will visit this remarkable piece of textile art at The D-Day Story.